I believe fossil fuels will be replaced sooner or later by electricity. This might prove to be a good thing as heat pumps and electric vehicles are two excellent energy efficient solutions. Thus, electric consumption is rising and is due to keep rising in the next decades. 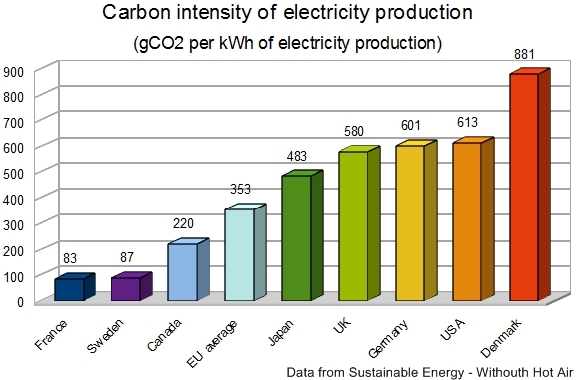 Having low carbon sources to generate electricity is very thus important for a country. This is the occasion for me to propose you data on the carbon intensity and origin of electricity generation in some affluent countries. One of the conclusions that come to my mind after researching for this topic : Nuclear is not be the absolute evil some want you to believe. Indeed, it enables us to generate a lot of low carbon electricity. Of course, it is not perfect, but there is no such thing. I found the data of this table in Sustainable energy – without the hot air, my favorite green reading. Here is another table giving the origin of the electricity. 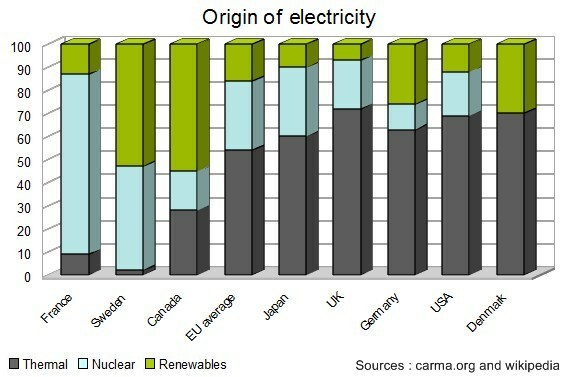 The breakdown is between thermal, nuclear and renewables. I am quite astounded at the correlations between the two tables. Countries with more than 50 percent of their electricity coming from thermal solutions have carbon dioxide emissions superior to 400 grams per kWh.